Cologne - It was a dramatic afternoon at the bottom of the Bundesliga as the battle to beat the drop intensified, with Hamburger SV moving off the foot of the table, but VfB Stuttgart and Hannover 96 suffering setbacks. bundesliga.com rounds up the action from a thrilling Saturday afternoon in Germany's top flight. Hamburger SV picked up their first win since February as the floodgates finally opened with a 3-2 victory over FC Augsburg at the Imtech Arena. Ivica Olic ended HSV's longest ever goal-drought to put the Red Shorts in front before Pierre-Michel Lasogga added a second. Raul Bobadilla pulled one back almost instantly and Tobias Werner levelled for Augsburg in the second half, but Lasogga struck again to earn the hosts three precious points. New Hamburg coach Bruno Labbadia had expressed his faith in his strikers finally finding the back of the net after six barren games, and it was not long before they repaid his trust as Olic diverted Zoltan Stieber's shot in to score HSV's first goal in 595 minutes. Lasogga subsequently went close from a free-kick, before heading in Matthias Ostrzolek's cross to make it 2-0. Familiar failings emerged minutes later, though, when defensive sloppiness allowed Bobadilla to head Augsburg back into the game. Alexander Esswein wasted a good early chance to bring the visitors level in the second half before Werner obliged, netting a deserved equaliser to crown a good spell of pressure from the Fuggerstädter. The hosts were determined to take all three points, however, and Lasogga replied with an unstoppable shot into the roof of the net to put Labbadia's men back in front and lift them from the foot of the Bundesliga standings. Baden-Württemberg rivals VfB Stuttgart and SC Freiburg were locked together in a dramatic 2-2 derby draw at the Mercedes Benz Arena on Saturday. TSG 1899 Hoffenheim boosted their challenge for a berth in the UEFA Europa League next season with a 2-1 win at Hannover 96 which keeps the Lower Saxony side in the thick of the relegation battle. Anthony Modeste gave the visitors the lead within 60 seconds, but a Lars Stindl penalty levelled matters in the 28th minute. Sven Schipplock ruined Michael Frontzeck's first game as Hannover coach, though, with an 83rd-minute winner. 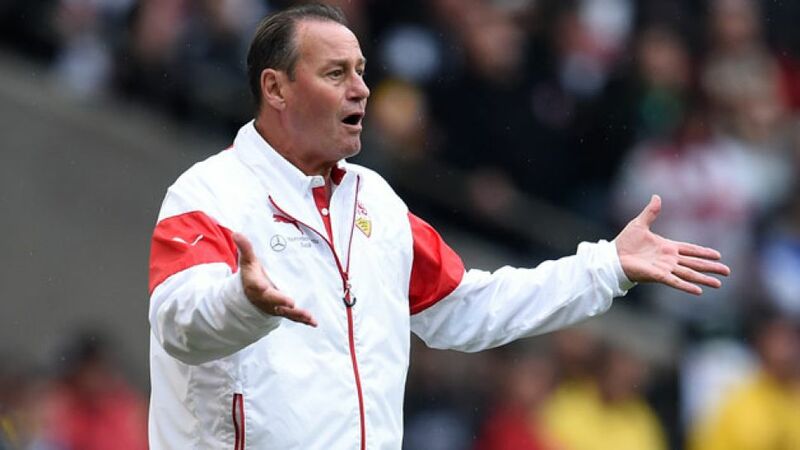 Frontzeck had barely taken his seat on the Hannover bench for the first time when Modeste diverted Roberto Firmino's scuffed shot in to put Hoffenheim in front. The hosts nevertheless responded well and, when Manuel Schmiedebach was fouled inside the penalty area, Stindl brought them deservedly level from the spot. Hannover rode their luck thereafter with Tobias Strobl's header hitting the post and Modeste nearly turning the ball in. A draw was not the result either side were looking for and both came out fighting in the second half, keeping everybody inside the HDI Arena on the edge of their seats. Stindl wasted a good chance for the hosts before Joselu shot over. Such wastefulness came back to haunt them as Schipplock headed in Adam Szalai's cross to earn Hoffenheim all three points.